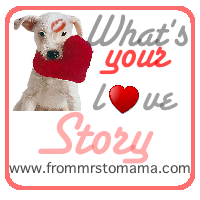 Forever After Blog: What's Your Love Story? 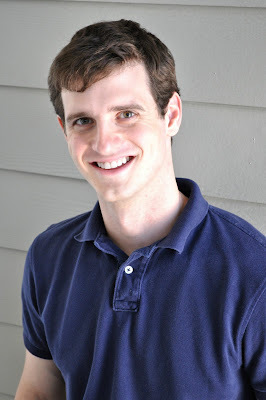 I found this fun Valentine's Link-up via one of my favorite blogs, Blue Eyed Bride. I enjoyed reading others responses, so I thought I'd do a What's Your Love Story post as well. How long have you been together and how did you meet (aka what's your love story)? We met almost 4 summers ago at a summer Bible study hosted by a family from our church. He was about to begin his senior year of college and I had just finished my fearsome freshman. I was standing over by a table with some fresh cinnamon bread talking with a girlfriend of mine. He made the excuse he needed another slice of cinnamon bread. About 5 times. He struck up a conversation and the rest is history. We got married in May 2010. Where did you get married at? Big or small wedding? We got married at Duke Chapel in Durham, NC. My husband went to Duke, he proposed at Duke, we spent countless hours there (though I wasn't a student there). Needless to say it was the perfect place to say "I do". I'd say our wedding was big and small. 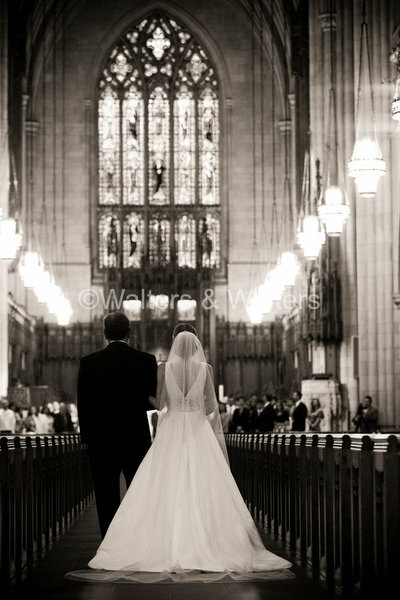 While we had a Duke Chapel wedding, which is understood to be a big affair, we had less than 100 guests. To be honest I was terrified by the idea of having lots of people there. We compromised and it ended up even better than we planned because it was both elegant, yet intimate because we were able to genuinely greet each of our guests. Name 3 things you love most about your honey. He is passionate that goodness prevail. His dedicated work in the Christian non-profit sector has made that more clear to me. Tell us how he proposed. This is a story I love to tell! To make a very long story short, I was hanging out with a friend on Duke's campus, she told me she wouldn't be able to drive me back to Raleigh (where we were in school) because she had a meeting to make and was already running late. I told her not to worry because Mike was grabbing dinner with a friend nearby and could drive me home. (Little did I know my friend was in on the whole thing). Mike met up with me and we started to walk back to his car. He said we had to cut through the Duke Gardens to get back since he parked far away (nothing out of the ordinary). It was pitch black in the gardens and I could barely see three steps in front of me. 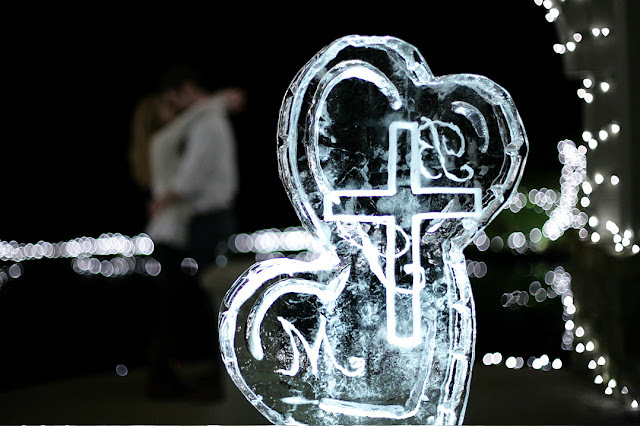 In an instant the gardens lit up with 10,000 twinkling lights, an ice sculpture with our monogram and a cross, and Mike dropped to one knee with my dream ring. 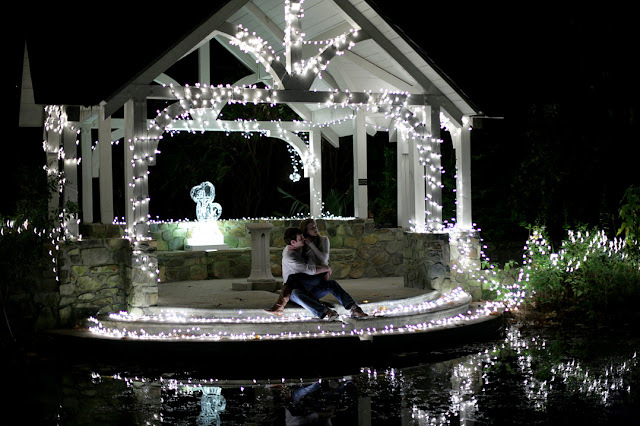 And little did I know that he also had a photographer friend hidden in the bushes capturing the whole thing....it was perfect...he certainly made it hard on himself to ever be able to top that one, haha. Give us one piece of advice on keeping a relationship strong and full of love. Respect and appreciate each other and pray for one another daily. Show a picture of what love means to you. 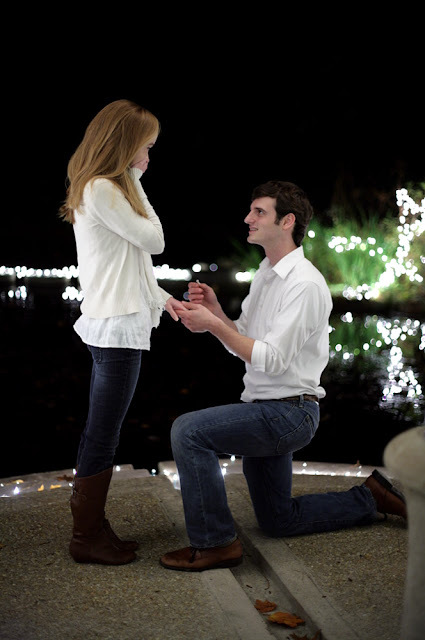 awe I love your proposal story! Aw, what a cute little story! Love, love, love it! Ashley- thank you so much, I cherish all these photos. And yes, it was so sweet that he had a photographer ready to take photos of the proposal. He knew how much I loved photos!